By: Juan, Chris, and Alberto The location of El Paso is at the western-most point of Texas. If you know latitude and longitude, it is 106 10 W and 31. 3 The location of El Paso is at the western-most point of Texas. 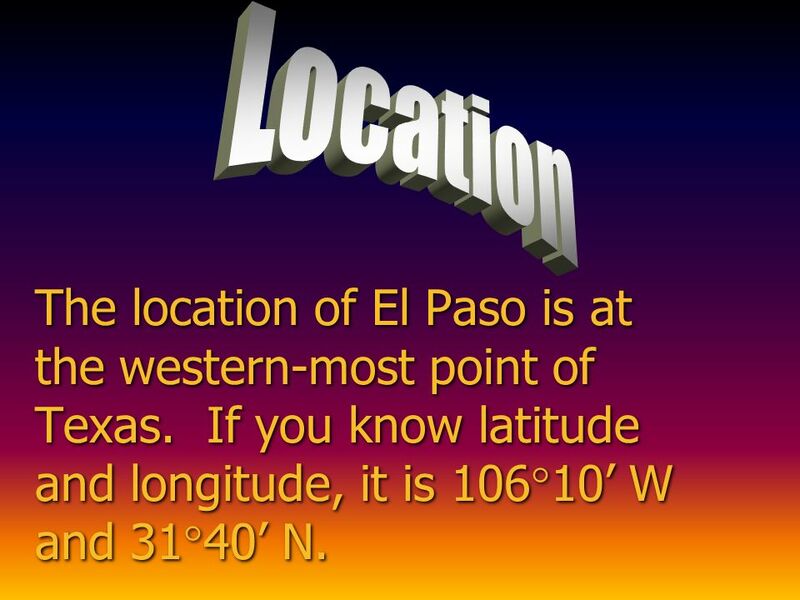 If you know latitude and longitude, it is 106 10 W and 31 40 N. The location of El Paso is at the western-most point of Texas. If you know latitude and longitude, it is 106 10 W and 31 40 N.
4 Authentic Mexican food is a favorite in El Paso. It might be because it was settled by Spain. Its also because El Paso is an important port of entry to the U.S. from Mexico. 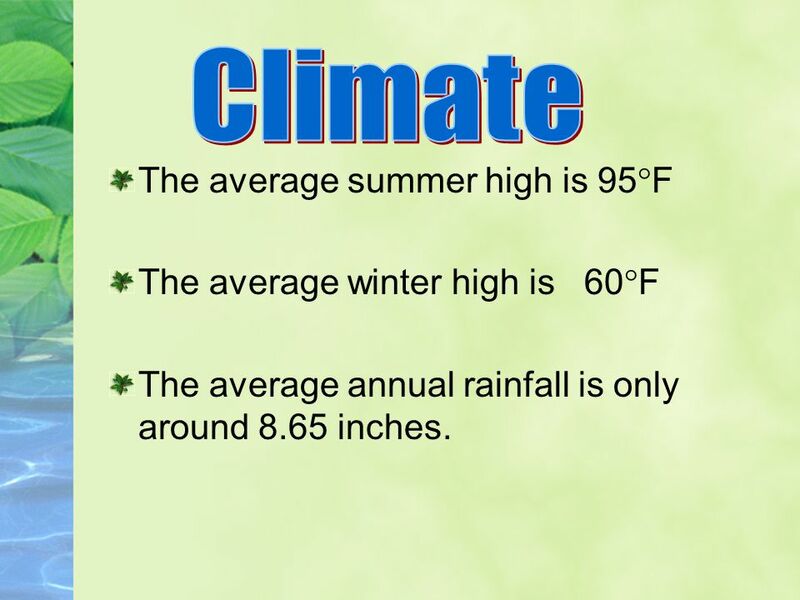 5 The average summer high is 95 F The average winter high is 60 F The average annual rainfall is only around 8.65 inches. 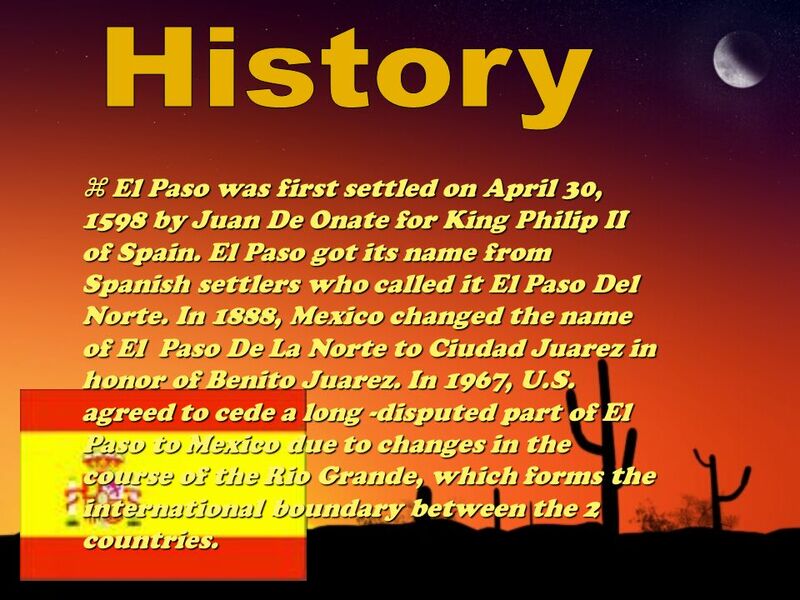 6 El Paso was first settled on April 30, 1598 by Juan De Onate for King Philip II of Spain. 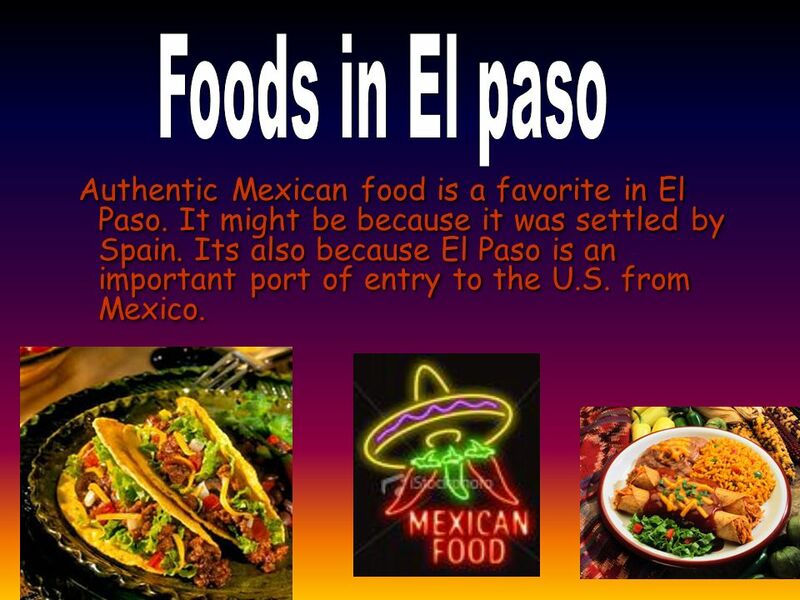 El Paso got its name from Spanish settlers who called it El Paso Del Norte. In 1888, Mexico changed the name of El Paso De La Norte to Ciudad Juarez in honor of Benito Juarez. In 1967, U.S. agreed to cede a long -disputed part of El Paso to Mexico due to changes in the course of the Rio Grande, which forms the international boundary between the 2 countries. El Paso was first settled on April 30, 1598 by Juan De Onate for King Philip II of Spain. El Paso got its name from Spanish settlers who called it El Paso Del Norte. In 1888, Mexico changed the name of El Paso De La Norte to Ciudad Juarez in honor of Benito Juarez. In 1967, U.S. agreed to cede a long -disputed part of El Paso to Mexico due to changes in the course of the Rio Grande, which forms the international boundary between the 2 countries. 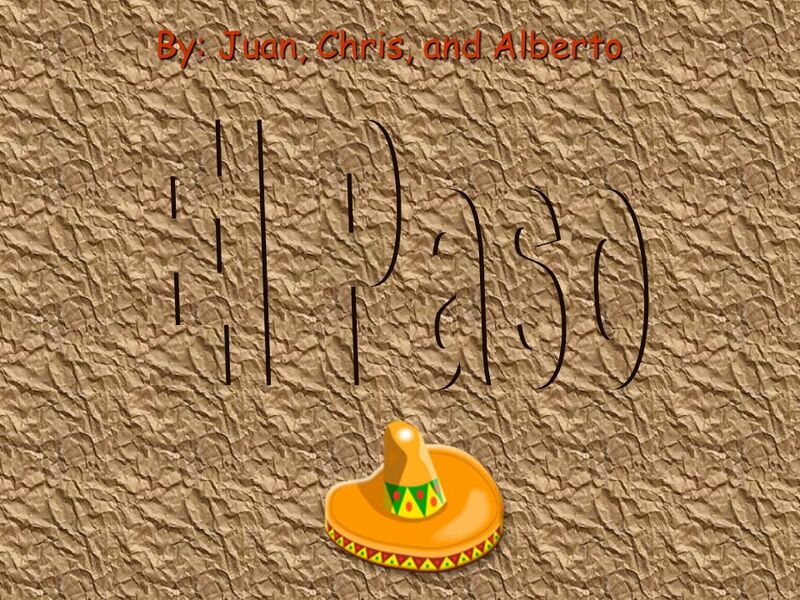 Download ppt "By: Juan, Chris, and Alberto The location of El Paso is at the western-most point of Texas. If you know latitude and longitude, it is 106 10 W and 31." By: Juan, Chris, and Alberto The location of El Paso is at the western-most point of Texas. If you know latitude and longitude, it is W and 31. Why we speak Spanish. By: Erika Liebel Who was here before 1519? El Paso, Texas United States of America. United States. Secretaria de Relaciones Exteriores Border Infrastructure. MOUNTAINS AND BASINS By: Lizzie, Emilie, Hannah, and Emily! An idea popular in the U.S. during the 1800s that the country must expand its boundaries to the Pacific. American Progress by John Gast. LOUISIANA PURCHASE DOUBLES THE SIZE OF THE U.S. OPENS UP LANDS FOR WESTERN SETTLEMENT. Unit 5: Mexican National Tension with Spain and the U.S. Section One Notes. IMMIGRATION TO TEXAS By: Allison Clary. INTRODUCTION  In this power point you will be learning about is how the immigrants lived in Texas, how the faces.  Two of the most powerful countries in Europe  Both wanted control of Texas, but needed to occupy land  Spain had explored Texas for gold. 1 Center for Research in Water Resources The University of Texas at Austin Binational Water Management Information System: Rio Grande Basin Carlos Patiño. The Paso del Norte Watershed Council Promoting ecosystem health and economic sustainability in the Paso del Norte Watershed.